Your project is an interesting and important one. Documenting trends in art as they rise and fall tells us a great deal about the society and times we live in. As you say, the art of kumihimo is an ancient one. I attribute its recent resurgence to the introspection–individually and collectively–that seems to parallel the introspection of America in the 1960s as it sorted through civil rights, assassinations, and the war in Viet Nam. Uncertainty, such as that resulting from economic crises, and fear, such as that resulting from global strife and tension, turns many of us to look inward for answers. 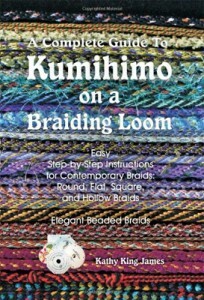 For me, kumihimo provides that opportunity for introspection and for creation resulting from that look inward. 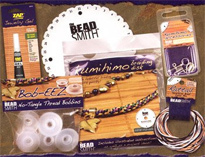 When my mother was undergoing cancer surgery, I sought the rhythm of kumihimo braiding. I found my mantra, one up, one down, turn…one up, one down, turn…to be soothing during a stressful time. As I worked, I experienced the ‘come together’ phenomenon that, as you say, is the definition of kumihimo. At first, I worked only with strands of a single color of thread, braiding them into a ‘whole.’ That work expanded to include other fibers, and then beaded fibers and wire, and colorful cores. 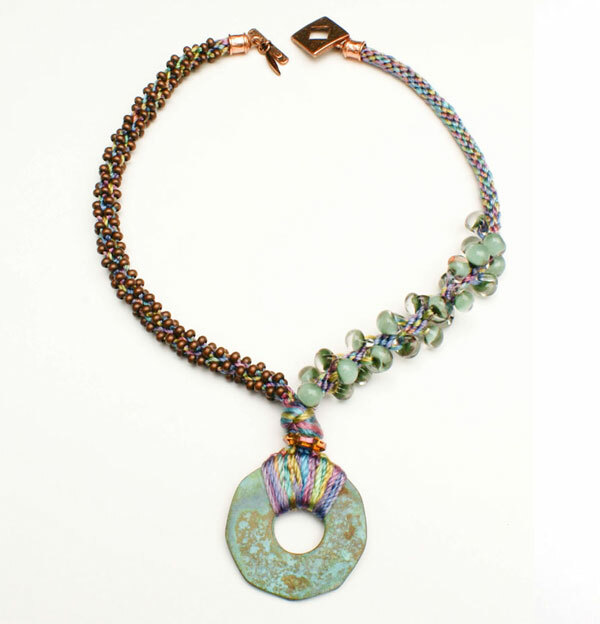 Today, I use my kumihimo designs to bring together many disparate elements into a single, unified whole. That unification expresses my deepest hope for peace–between people and among peoples. That hope is reflected in two of my pieces, an asymmetrical beaded kumihimo necklace (http://www.tealeves.com/shop-by-category/asymmetrical-kumihimo-and-verdigris-pendant-necklace) and a mixed media kumihimo necklace (http://www.tealeves.com/shop-by-category/kumihimo-mixed-metal-torsade-necklace). In the former, variegated strands bifurcate into two braids of different designs. The braids are permanently joined at a simple multi-sided pendant and again at the clasp, that can be opened and closed. I think of the peoples of the world when I hold that piece in my hands–all different, some groups aligning with others, some remaining separate; yet all are unified by virtue of our humanity. In the second, also an asymmetrical piece, wire kumihimo encircles a silk strand core. 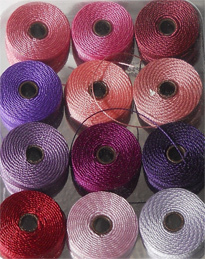 The silk strands are remnants of saris collected by a women’s cooperative from a factory floor. 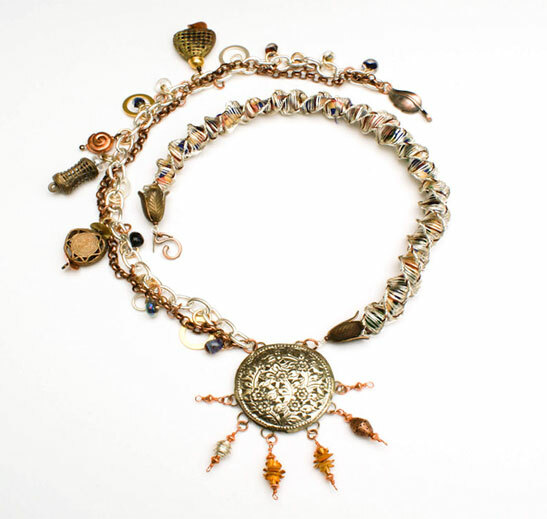 The second side of the piece features chains of different metals, each with charms, of different materials, dangling from the chains. They symbolism of ‘hugging’ the soft and still sari silk along-side the more noisy and sometimes clashing charms unified by the design, the pendant, and the clasp, is not an accident. It’s a statement of what I hope to see in our world.